6-foot-4 senior Dee Dee Mathelier (32) scored a team-high 13 points and played a pivotal role in Acton-Boxborough’svictory over Natick in the first round of the D1 Central Tournament. NATICK, Mass. - The opening game of the MIAA Division 1 Central tournament between the Acton-Boxborough Colonials and the Natick Redhawks was filled with tension, excitement, and two teams playing desperately. However, the game was not filled with a lot of scoring. The lack of offense did not bother Acton-Boxborough (13-10), which knocked Natick (13-8) out of the D1 Central Tournament with a 41-38 victory on Monday night at Natick High School. Acton-Boxborough head coach Rick Kilpatrick said that the Colonials are accustomed to playing in games that are dominated by defense. “We’ve been a really good defensive team all year,” Kilpatrick said after his team’s hard-fought win. Kilpatrick added that “scoring is sometimes a challenge” for the Colonials. The two teams struggled to find a rhythm on offense. Both squads are up-and-coming groups that have not played in the tournament for a few years, and most of the players on the floor were participating in their first MIAA tournament game. In the second quarter the Colonials began to settle in on offense, courtesy of the play of senior captain Jack Maddox, who also played in the tournament as a freshman. Maddox came into the night as the only player on the Colonial roster with experience in the tournament. Maddox made a layup, a pair of free throws, and a floater in the second quarter, scoring six of Acton-Boxborough’s points on an 8-2 run that opened up a 22-13 lead. Acton-Boxborough continued to play hard on the defensive end, limiting the Redhawks to four points in the first six minutes of the second period. Natick closed the quarter on a 5-0 run. After junior Will Brodnitzki (4 points, 10 rebounds) made two free throws, junior captain Peter Ryan (8 points, 5 rebounds) hit a three-pointer from the corner at the first-half buzzer, diminishing Natick’s deficit to 22-18 and giving Natick momentum going into halftime. The Colonials opened the second half on a 10-2 run. The first two baskets of the period belonged to senior captain Nick Giaconia, who finished with 11 points and 3 rebounds. 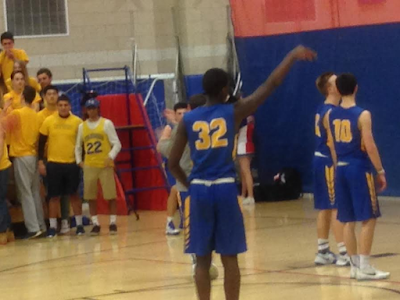 Acton-Boxborough, which has three players listed at 6-foot-4 or taller, began to utilize its size advantage in the third quarter. 6-foot-4 forward Dee Dee Mathelier (game-high 13 points, 9 rebounds, 2 blocks) and 6-foot-8 center Luke Rogers (10 points, 10 boards, 3 blocks) combined to score ten points in the third period. Mathelier and Rogers touched the ball on nearly every Colonial possession, as their guards worked the ball into Mathelier and Rogers in the post, or they drove to the basket and made layups over shorter Natick defenders. Coach Kilpatrick said that the Colonials had more success getting the ball inside to their bigs in the second half. Acton-Boxborough’s ability to capitalize on it height advantage allowed it to open up a 36-24 lead as time wound down in the third quarter. Ryan used creativity to cut Natick’s lead to eight at the end of the third quarter. Unable to find a teammate while attempting to inbound the ball, Ryan passed the ball off the back of an Acton-Boxborough defender. Ryan caught the ball and laid it in. The basket cut the Colonials’ lead to 36-28 at the end of the third quarter. Both defenses locked in again at the start of the fourth quarter. The first bucket by either team in the final period was a layup by Mathelier with 6:06 remaining. Natick junior captain Sho Kinugawa (8 points, 3 assists) led the Redhawks on a 7-0 run. After making a three-pointer at the top of the key to cut the Natick deficit to 38-31, Kinugawa assisted on layups by classmates Quinn Palmer and Stanley Smudin. Smudin’s basket cut Acton-Boxborough’s lead to 38-35 with 4:22 remaining in the fourth quarter. The Colonials had to call a timeout as the Natick fans stood on their feet, hoping to see their team complete the comback. The Colonials went back inside to respond, as Rogers made a layup to expand Acton-Boxborough’s lead to 40-35. After Rogers hit a free throw to make the Colonials’ lead 41-35, Natick junior Jahden Erold cut the deficit in half with a three-pointer with 1:19 remaining. After an Acton-Boxborough three-pointer rimmed out and the Redhawks pulled down the rebound, the Colonials clamped down on defense once again. Natick inbounded from half court with 18.6 seconds remaining and a chance to tie the game. The Colonials closed out on every potential Natick look, and the Redhawks were not able to attempt a three-point shot. Erold tried to drive down the baseline for a quick two-pointer, but Rogers poked the ball away and held onto the basketball until the buzzer sounded, at which point the yellow-shirted students from Acton-Boxborough stormed the court and celebrated the hard-fought victory with the players. Acton-Boxborough advances to the Division 1 Central quarterfinals, and the Colonials will visit top-seeded Franklin on Thursday at 7:00 PM. Coach Kilpatrick knows that his team will have to put up more points if they want to pull off the upset against the Panthers. However, this will be Franklin’s first tournament game, and the Panthers will look to ride their momentum and stingy defense to take down the top-seeded Panthers.